This spreading, deciduous shrub brings welcome colour to the garden in late summer and early autumn when many other flowers have gone over. Masses of disc-shaped, vivid cobalt-blue flowers appear from August to October, and in autumn, the leaves turn a rich russet-red. It's best in towards the front of a sheltered, sunny border in soil that does not get too dry. Garden care: In early or mid-spring cut back the flowered shoots to within 2.5cm (1in) of the old growth. After pruning apply a generous 5-7cm mulch of well-rotted garden compost or manure around the base of the plant. This has done well right from the start, a summer long abundance of lovely flowers though not so many autumnal shades in the foliage as I have seen in previous (and gardens) I have had - 2018 was a difficult year for many plants. I have used this plant several times before and love it. 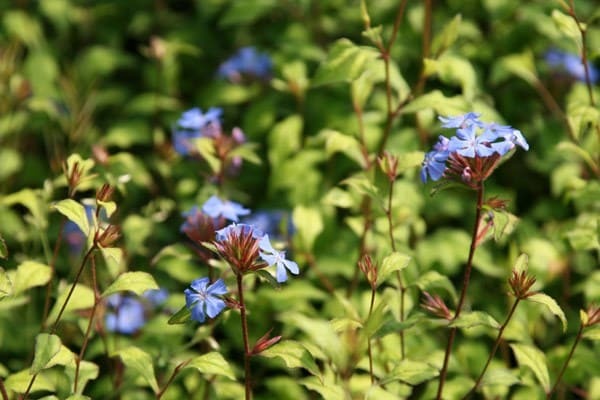 It's completely hardy, has gorgeous luminous blue flowers throughout the late summer into autumn, and the leaves turn a lovely russet colour before falling. It prefers a sunny spot and will grow to about a metre all round. Added to that, the bees love it......what's not to like! The lumbago was planted into a mixed bed and is doing ell. 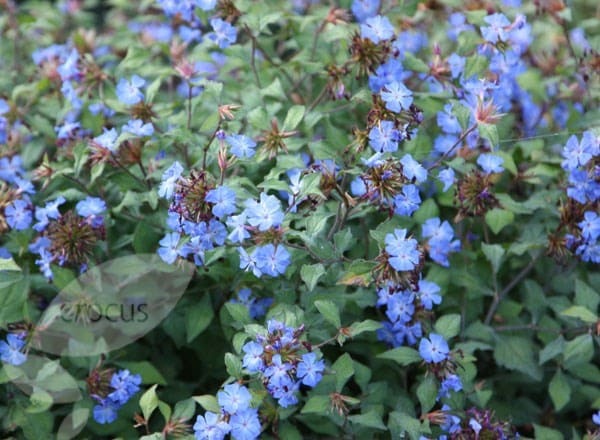 A very hardy little shrub which I would call a "plumbago" because my parents had one years ago! Flowers are a briliant blue and are very sriking. It is coping with the heat and lack of rain but I water it most nights. I'm trying out a couple of these plants as companions to Hydrangea Bluebird shrubs on a steep bank. The hydrangeas are more pinky blue so I hope the sharp blue of the ceratostigmas with be a nice contrast and the relative sizes will work. The ceratorstigmas appear to be vigorous growers. I've planted them higher up the bank to get more sun. The latter don't have the colourful foliage of their smaller cousins, instead it's a fresh green for most of the time. I first 'met' this plant somewhere on the edge of open woodland in Western Europe (I forget which country). And I guess this experience has conditioned the way I use it - in informal places often backed by shrubs so that it grows away from them. I therefore don't fully agree with Crocus's advice of full sun; the plant is more versatile than that.